Copenhagen is the capital city of Denmark. It is situated on the coastal islands of Zealand and Amager. Copenhagen is the capital, and also the largest city in Denmark. It is mostly situated on the eastern coast of the island, Zealand. A further small area of the city is situated on the island of Amager. The city is connected to the southern Swedish city of Malmo via the Oresund bridge. Founded in the 10th century, it was originally a Viking fishing village. It became Denmark's capital city in the 15th century. Famous Copenhagen landmarks include Tivoli Gardens, the Little Mermaid Statue, the Amalienborg and Christiansborg palaces, Rosenborg Castle Gardens and Frederik's Church. Here you can find an automatic compilation of DW content on Copenhagen. Debris believed to be from a cargo train smashed into a passenger train traveling in the opposite direction towards Copenhagen during a severe storm. It has been described as Denmark's worst accident since 1988. The Arc de Triomphe in Paris, the Little Mermaid in Copenhagen and the Holocaust Memorial in Berlin are famed monuments that draw millions of annual visitors. But this has also made them a the target of vandalism. Pro-independence party Naleraq has quit the coalition over a plan for Denmark to part-fund an upgrade of three airports. Greenland's government picked Copenhagen as project partner over Beijing to avoid upsetting the US. Advocates say cash costs more money to process and raises the risk of crime. But studies show some groups still rely on it. An absurd zig-zag bike lane comes as the German capital seeks to model itself after bike-friendly cities like Amsterdam and Copenhagen. It's apparently a hard path to follow. Denmark's center-right government plans to eliminate what it calls "ghettos" by 2030, in an attempt to integrate immigrants from largely non-Western countries. We spoke to people who live in a few of these "ghettos." Sleigh bells, reindeer and Christmas trees — but in July? The annual World Santa Claus Congress in Denmark celebrates exactly that amid sweltering temperatures. On the opening day of his trial for the murder of the Swedish journalist, Madsen claimed she died when exhaust fumes filled his submarine. He admitted to dismembering her body and disposing of it at sea. 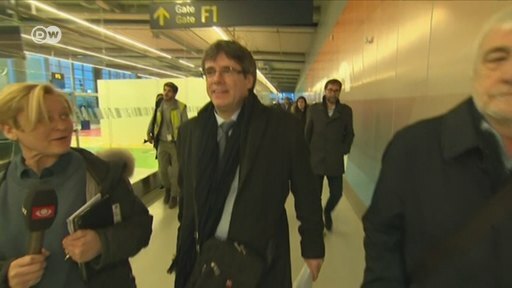 Carles Puigdemont landed at Copenhagen airport in the morning on a flight from Belgium, where he has been since fleeing Spain. He is slated to take part in a debate at the University of Copenhagen. A high-end bottle of vodka that was stolen from a Copenhagen bar has been found at a construction site. The gold and diamond-encrusted bottle was found intact, save for one thing — all of the vodka was missing. The reportedly $1.3 million Russo-Baltique bottle is made of gold and silver and has a diamond-studded cap. The owner of the Cafe 33 bar had been loaning the bottle from a Russian businessman.